The three-time world champion claimed a commanding victory in the bronze medal race. Clifford celebrates with his medal. EOGHAN CLIFFORD SECURED Ireland’s second Paralympic medal of the day as he timed his charge to perfection to claim bronze in the C3 Individual Pursuit. The 35-year-old, a three-time world champion, pipped Canada’s Michael Sametz in a head-to-head battle at the Olympic Velodrome tonight, claiming a commanding victory in the bronze medal race over 3km. Clifford, battling with a degenerative muscle disease, pulled away from Sametz and was 2.4 seconds ahead at the 2km mark. Although his opponent made up ground on the final few laps, Clifford had enough left in the tank to cross in a time of 3:40.201. 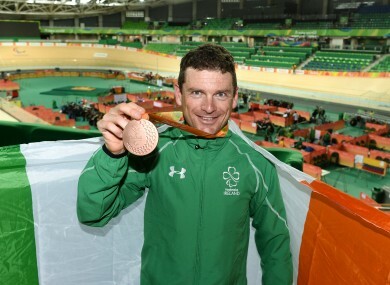 The winning margin was more than a second as he added a superb Paralympic bronze to his already impressive collection. Gold was won by David Nicholas of Australia with America’s Joe Berenyi having to settle for silver. Clifford, who only took up the sport two years ago, sneaked through to the bronze medal race from this morning’s qualifiers and while he admitted he wasn’t here to come third, it will be a major boost ahead of his road race and time trial next week. It capped a brilliant day for Ireland in Rio after Jason Smyth stormed to his third straight T13 100m gold earlier. Email “Brilliant day for Ireland in Rio capped as Eoghan Clifford claims bronze on the track ”. Feedback on “Brilliant day for Ireland in Rio capped as Eoghan Clifford claims bronze on the track ”.